We Live in the country so there’s lots of room for a garden but the temptation to garden in a container is still there. 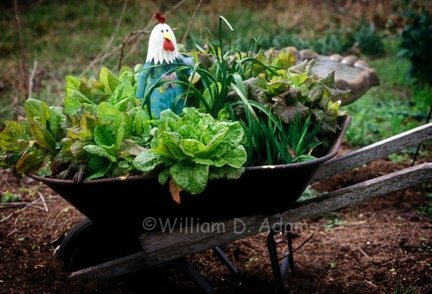 Container gardening is just plain fun. 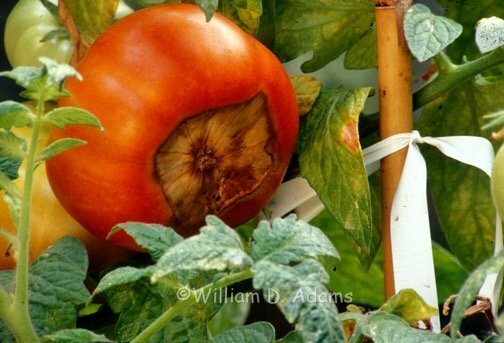 The benefits can include: starting with a new soil that drains well and that is relatively free of insect and disease pests, mobility—you can move the container into the greenhouse or garage to protect marginally hardy plants from the cold, big containers (usually the best kind) keep your plants away from short herbivores like rabbits and the soil in big pots won’t dry out too fast which can cause Blossom End Rot. Even most dogs won’t be able to relieve themselves in 30 gallon and larger pots. Being close to the house may even discourage sparrows from damaging your tender seedlings and transplants. 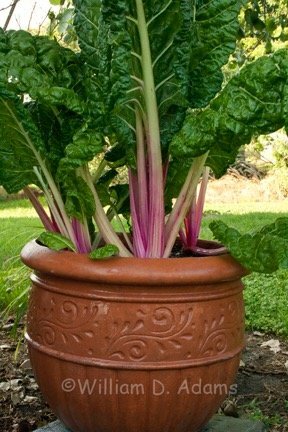 Big Ceramic Pots make beautiful and efficient growing containers for vegetables and flowers but they can be rather expensive. While most of us don’t expect to save a lot of money growing our own veggies, it’s understandable that many gardeners are looking for a more economical growing container. 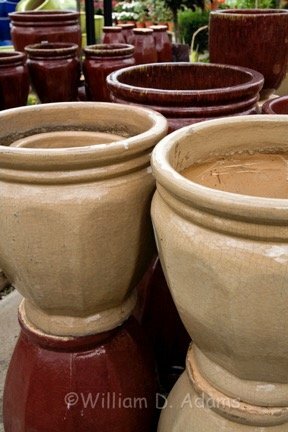 You can find everything at Arbor Gate from gorgeous ceramic pots to fifteen and thirty gallon black nursery containers. Got an old wheelbarrow. Drill a few holes in the bottom and you have created a big, portable pot. 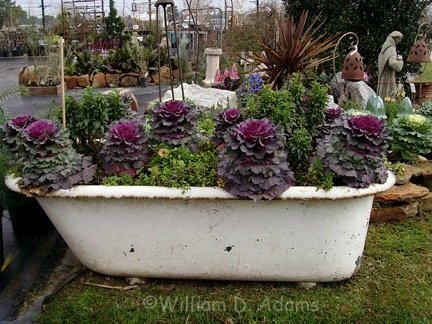 How about an old bath tub? Provide drainage and it becomes a really Big Pot. 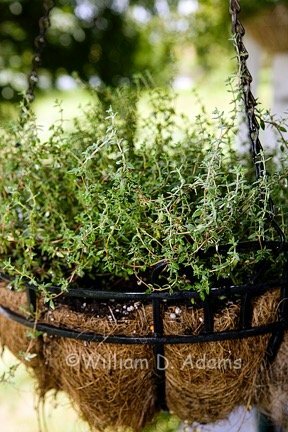 Hanging baskets are beautiful with flowers, but a basket with herbs could be hanging right outside the kitchen window. 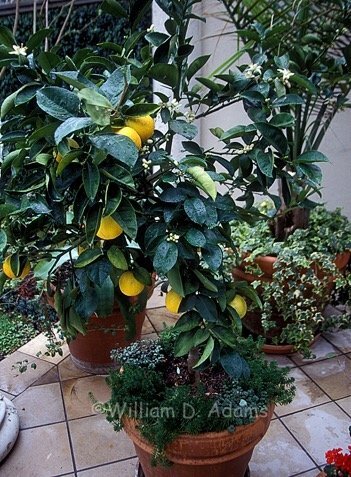 Taking care of tender citrus is a problem—not so much if you grow it in a moveable pot. If you love tomatoes and basil then you need more pots. 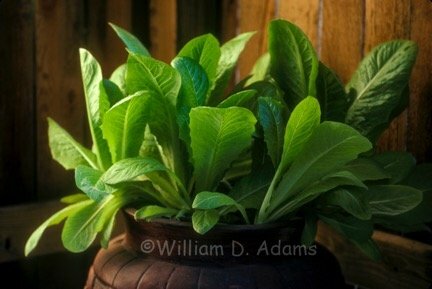 Try a big pot with bush cucumbers in the summer, Pac Choi in the winter or chard year ‘round? Yes, yes and yes. 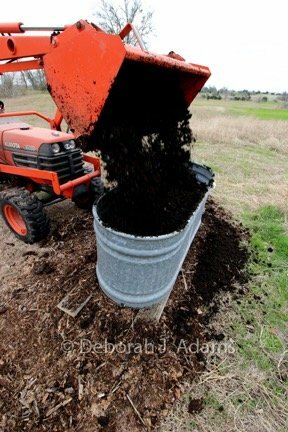 Before you plant anything in a container it’s important to realize that the soil mix is especially important. 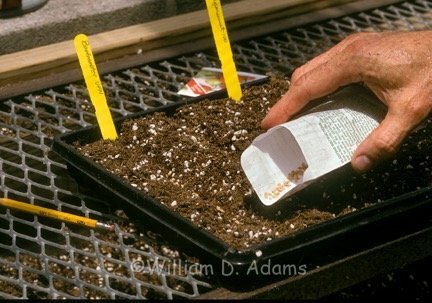 The same potting soil you used to grow seedlings is a good choice for containers, too. 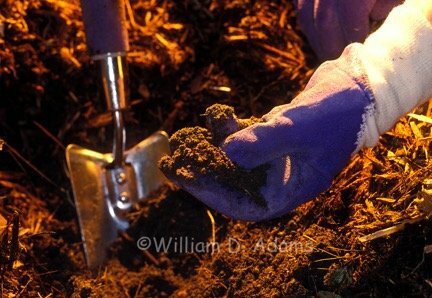 You need good drainage and it starts with a well drained soil. Soil dug out from the yard is likely to be heavy clay. 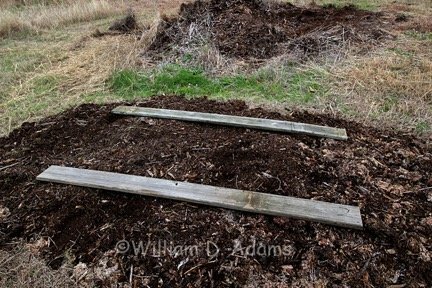 Even if you have a good loam soil, it may not make a good container soil. To avoid plugging the drainage holes, set the container on a few bricks or short pieces of 2 x 4. Make sure the hole isn’t covered and your container garden should thrive all season and for years to come. Check it every year to ensure that roots haven’t plugged it up. 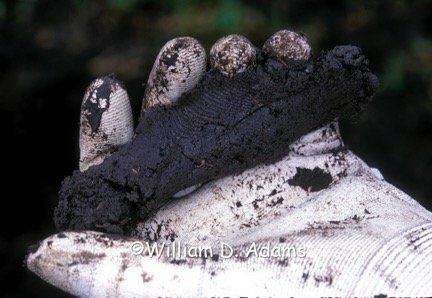 If necessary, use an old knife to cut out the roots and clear the drainage hole. 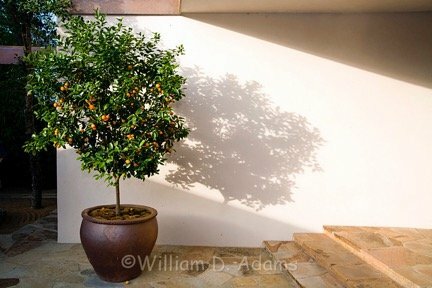 Smart Pots are something relatively new for the garden. They use a similar technology that has been used for long-term production of nursery plants. 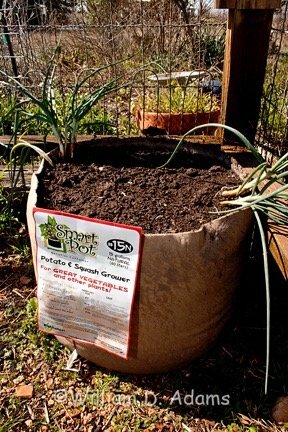 These containers will discourage the development of girdling roots (roots that circle in the pot and eventually cause the plant to be stunted). And trust me this is some tough material that both blocks penetration of large roots and allows air pruning of the tiny feeder roots so they don’t penetrate the fabric. Also consider that the pot in the photograph is just getting started (it’s filled with mushroom compost and a couple of rescued shallots). It will soon be planted to squash for summer production and I’ll have more photos in the future. Our latest container gardening project involves making use of a stock tank that was originally used to capture rainwater. The bottom had a rusted out hole and the edge seams were rusting, too. It’s the perfect Really, Really, Really Big Pot. 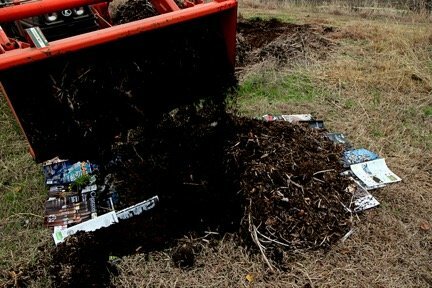 First we put down a layer of magazines that were headed for recycling anyway; then a layer of decayed wood chips from a tree trimming crew, plus a couple of old fence boards to ensure drainage. Next we layered the bottom with wood chips then filled it with mushroom compost. 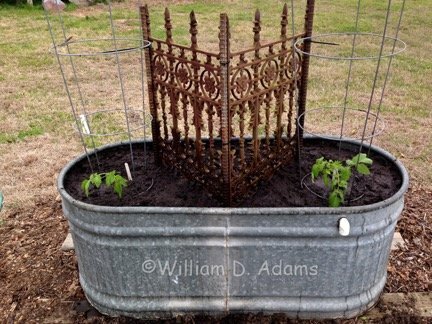 To support the tomatoes we used some antique wrought iron plus tomato cages. Finally we planted two Bush Champion tomato plants and we plan to add zinnias and herbs later. 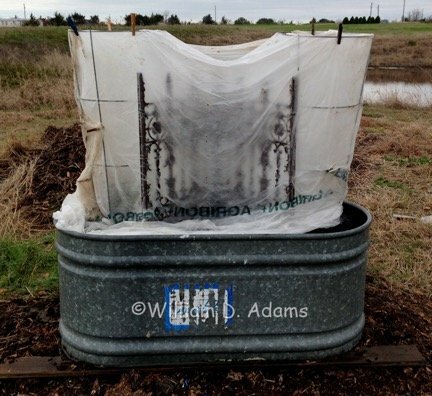 To protect our tender tomato plants from the wind we wrapped the whole thing with fiber row cover. Watering will be by hand to start with, but some type of low-volume irrigation (drip or micro-sprinkler) may be used later. The essential message here is that you don’t have to work up a big garden to enjoy gardening. 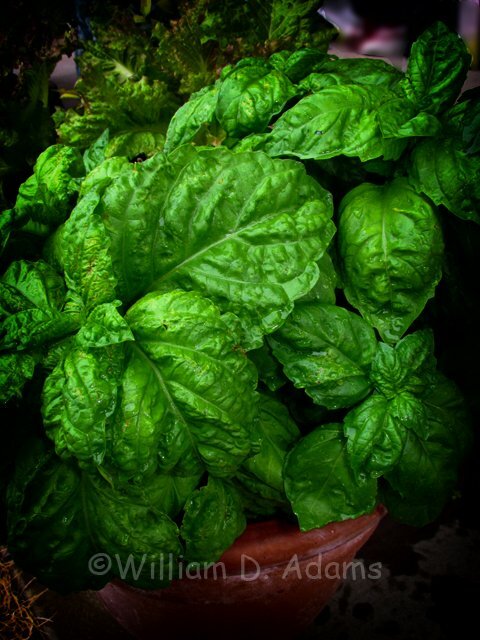 You will be surprised at just how much you can grow in containers—cool season leafy vegetables like lettuce and greens will keep you in salads and braised greens from October to June. 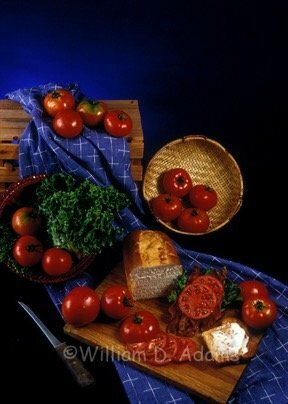 A bush tomato plant will put BLT’s on the table from May to October. 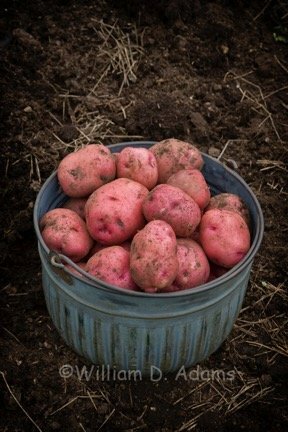 Get crazy and grow a potato in a pot just to show the kids where French fries come from. 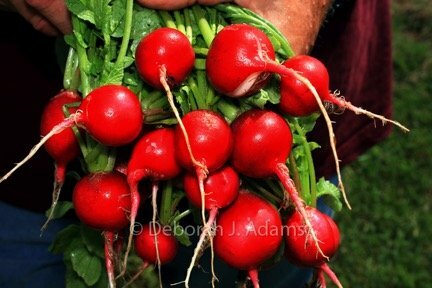 Try some green beans in the summer and radishes in the cool season. Who knows? 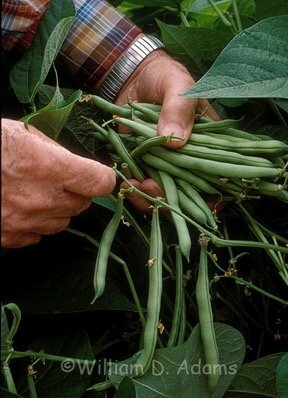 Your family might start to prefer fresh veggies to chips.